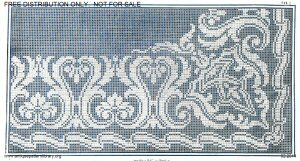 Large charted monochrome design for a formal border with corner. Ribbons and acanthus-like leaves. 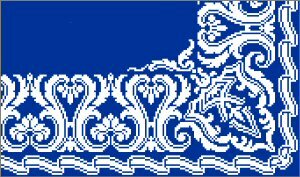 Suitable for cross stitch, darned net (filet or lacis), or very fine filet crochet. Probably intended for tablecloth. On loan from Sytske Wijnsma, scanned and edited by Judith Adele, charted by Sytske Wijnsma.